I thought the sourdough loaf that GMan managed to produce 3 months ago was good and you can see it here. He has continued to work on fine-tuning the method and I think his most recent effort is pretty well perfect. I am pleased to report that in a little under 2 months since his first attempt GMan has baked a very respectable sourdough loaf. In this post from February I mentioned that the first effort was a failure. In fact, unmitigated disaster might be an accurate description. 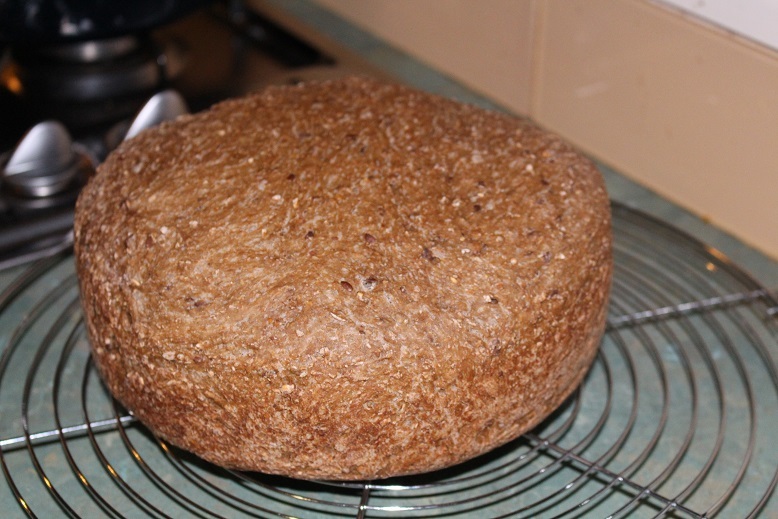 Since then he has persevered and tweaked the technique with a few more loaves which have been edible – best toasted. I have been watching from the sidelines as this is not gluten-free. The loaf which GMan baked tonight is the most impressive so far and he is justifiably rather proud of it. I think a couple of things contributed to the success. 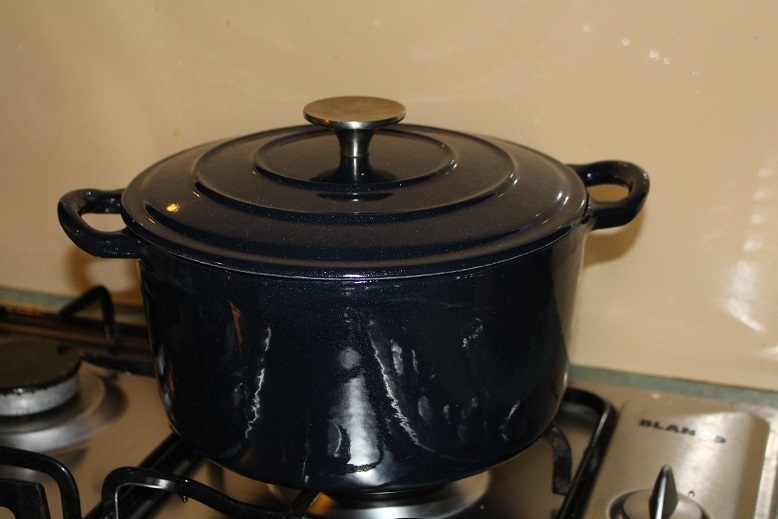 Firstly, the ‘starter’ is maturing with time and secondly, he cooked it in an enamel cast-iron lidded pot rather than on a tray. This is about as ‘cooked from scratch’ as you can get with only 3 ingredients used – flour, salt and water. My next challenge for GMan is to create a gluten-free ‘starter’. Watch this space for more details in the future. The desktop computer will not be back in action until the middle of the week so I am struggling with and old laptop which is very slow and not responsive. However, I am determined to persevere and bring you a recipe for gluten-free hot cross buns. Here is the original recipe which I used for the first batch which I made on Tuesday. The only alteration I made was to add another teaspoon of psyllium husk instead of the teaspoon of xanthum gum. The initial prototype was acceptable but I felt I could improve on the recipe a little. The instructions said that the recipe made 8 buns so I followed this and they were much too large for my liking. The buns also tended to spread on the tray rather than rise. Additionally, we prefer more spice and fruit. I made a note of this for my second attempt. Here is my amended recipe with method and photos. Do not be put off by the long list of ingredients. I have divided the ingredients into separate sections accoring to the method. Place sulatanas in a small bowl and cover with boiling water and allow to stand. Combine yeast, sugar and warm water in a small bowl and set aside to activate. In a another bowl combine the eggs and psyllium then add the add hot water and set aside to thicken. Place a large bowl of hot water in the oven and turn oven to 100C. Set timer for 5 minutes. After 5 minutes turn the oven off and remove the bowl. This means the oven will be perfect for the dough to rise. Place the flour, baking powder, bicarb, salt, sugar, spices and orange zest in a bowl and combine. Add the yeast mixture and egg mixture and mix thoroughly. Finally, drain the excess water from the sultanas and stir them into the dough. This step could be done by hand but I use my Kitchen Aid mixer. Turn the dough onto a well-floured surface. Although kneading is not required for gluten-free baking (no gluten to stretch) you can gently roll and fold the dough a few times before dividing it into suitable sized portions. I weighed my balls of dough and chose to make them 75g each which yielded 17 buns. Place balls of dough into muffin pans or on a tray and set the tray in the pre-warmed oven for 45 minutes. While the dough is rising prepare the egg wash to brush the top of the buns by whisking the egg and water together. Make the mixture for the crosses. Blend together the flour and enough water to make a smooth paste which can be piped onto the buns. 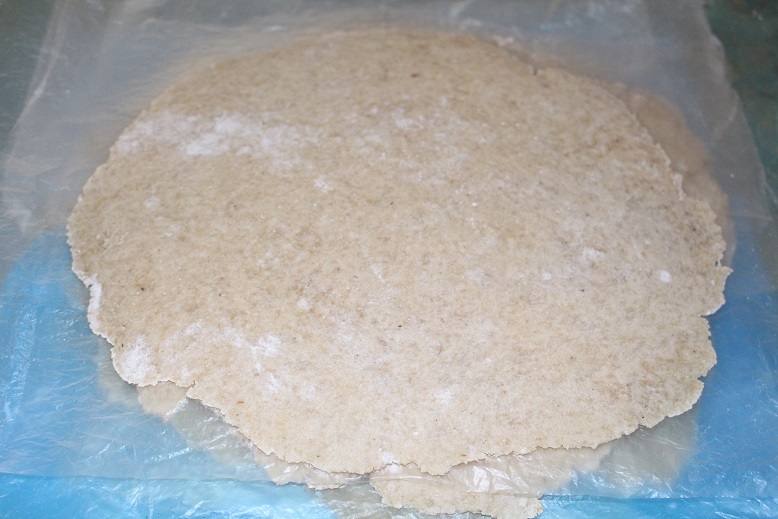 Place the flour paste into a plastic bag and snip a tiny piece off one corner. Remove dough from the oven and turn oven on to 200C to heat while you finish the buns. Brush with egg wash. Pipe crosses onto the buns. Return buns to the oven set at 200C and cook for 20 – 25 minutes. Place the sugar and orange juice in a saucepan and simmer gently until reduced and thickened. When the buns are cooked remove from the oven and drizzle with the orange glaze. I was very pleased with the result and the final word comes from my friend who said that it was just like the commercially produced fruit loaf. This has inspired me to try baking this recipe as a loaf which could be sliced and toasted. NOTE: The other variation is the type of flour used. The original rice uses tapioca and brown rice flour. I use my own mixture which includes both of these as well as potato and quinoa flours. You can choose a commercial gluten-free flour or you own combination as long as it totals 3 cups. Since there are only 2 of us to cook for, I do not prepare huge quantities of food but it is nice to have a few meals planned and prepared. The other factor that influences my decision is that I prefer to use the oven efficiently when it is turned on. Yesterday I sorted out what was lurking in the freezer and decided that this week we would eat what I could make using freezer and pantry ingredients. I should really only need to buy some fresh fruit and vegetables. I started by making gluten-free pizza bases. I par-cook these in the oven then freeze them for later use. Here they are ready to freeze. I have some old cereal packets which I use to separate the bases when they go in the freezer. 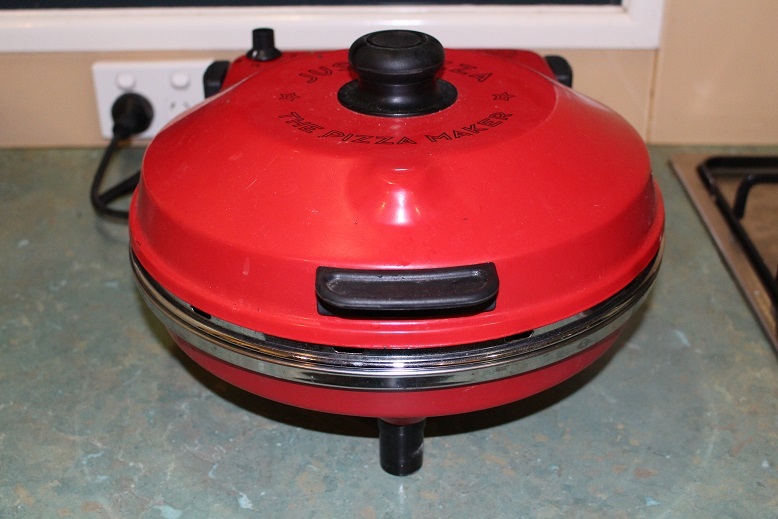 It is simply a matter of adding the toppings and cooking in the bench-top pizza-maker. Next, I decided to make some gluten-free muffins which turned out to quite acceptable using a standard recipe and simply substituting gluten-free flour. 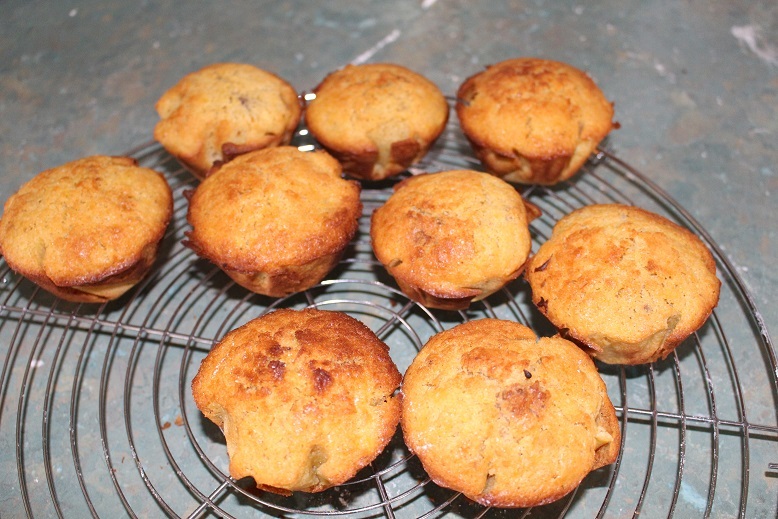 I made 2 batches – orange, walnut and sultanas in one and the other were banana, walnut and mixed spice. The catalyst for these were the sad looking banana that I rescued from the fridge at work on Friday and some orange pulp I found in my freezer. At the same time I made some gluten-free wraps for lunches. 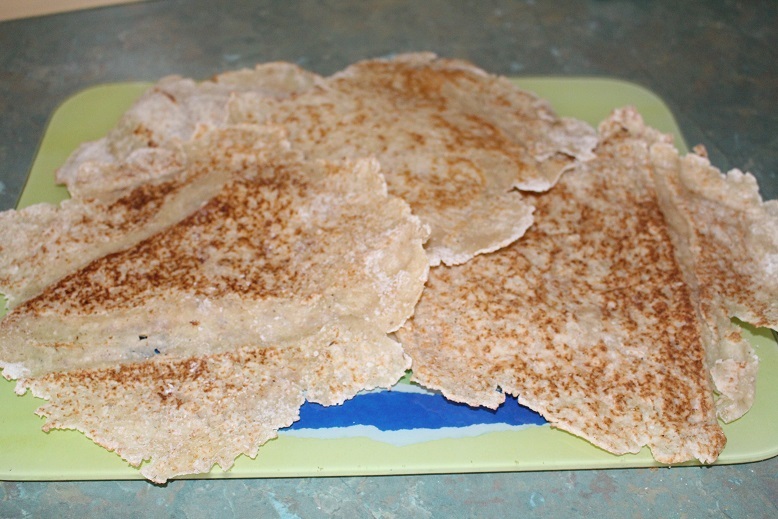 These are cooked in a hot, dry frying pan and can be stored in the fridge for a few days. A pack of sausages which had been left in the freezer by our house-sitters were grilled and sliced then made into a sausage casserole which made 4 serves. I usually cook a bulk amount of dried red kidney beans in the slowcooker and freeze them in portions ready to use. 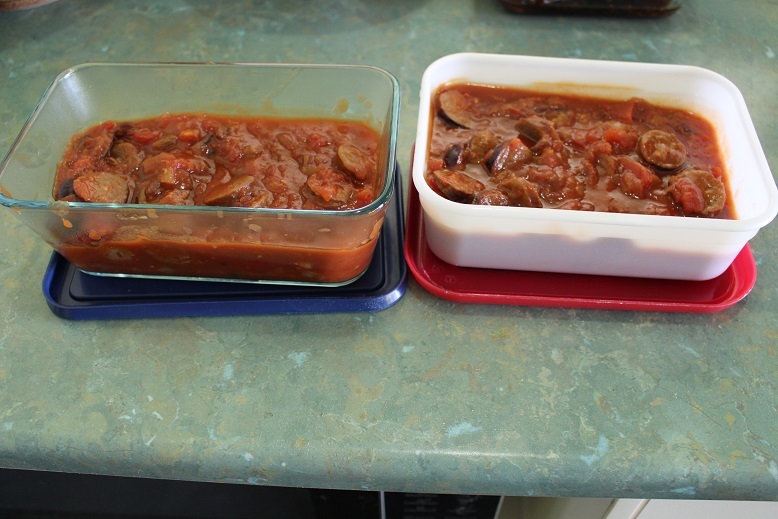 I found a pack in the freezer as well as a pack of diced beef so I put them in the slowcooker with frozen cherry tomatoes from last season, frozen diced onion and some spices to make 4 serves of chilli beef. That bubbled along all day while I was doing the other cooking. So, I have the basis of 15 serves of dinners, 6 serves of lunches and 20 muffins. Do you cook more than one meal at a time? A big occasional cook-up, perhaps? 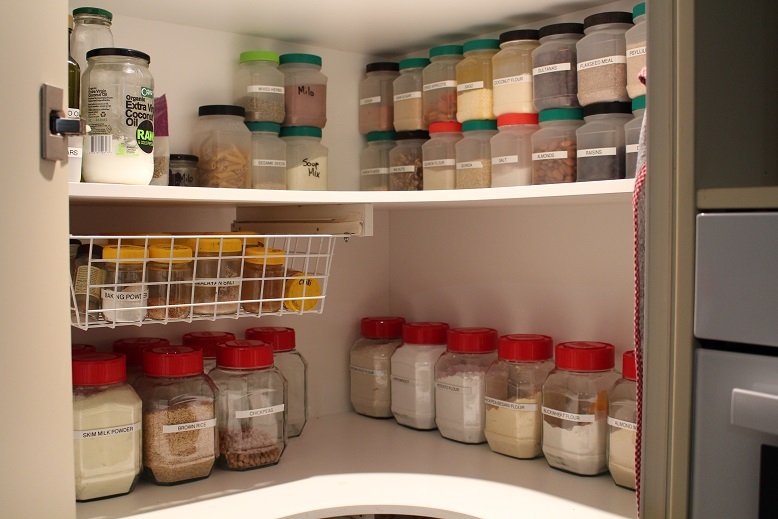 Today it was time to clean and tidy up my pantry. It is really not too bad but was definitely time to check for anything lurking in the background. I wiped out all of the shelves, decanted a few things into the new jars and generally re-arranged it to work a bit better. 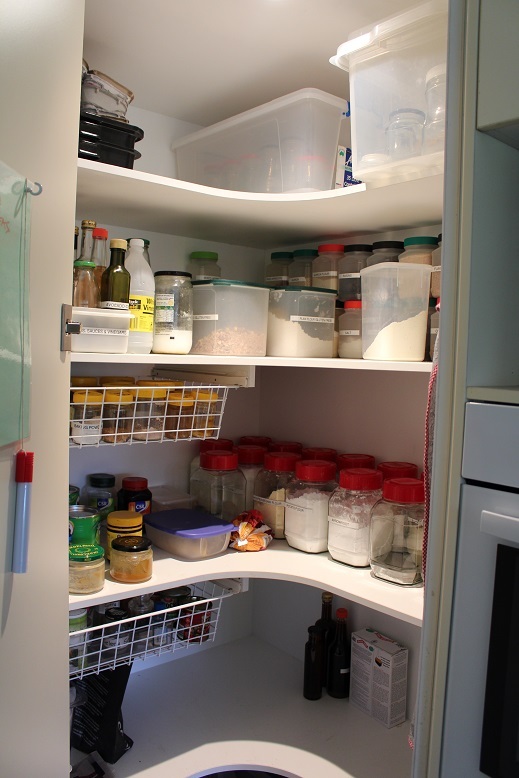 The space on the bottom shelf is where the dehydrator normally lives but I was using it when the photo was taken. The pack in the bottom right-hand corner of the photo is some gluten-free bread mix which was 18 months past its best before date but I made it anyway and it turned out well. There is a second pack in the box which I might make up next weekend. 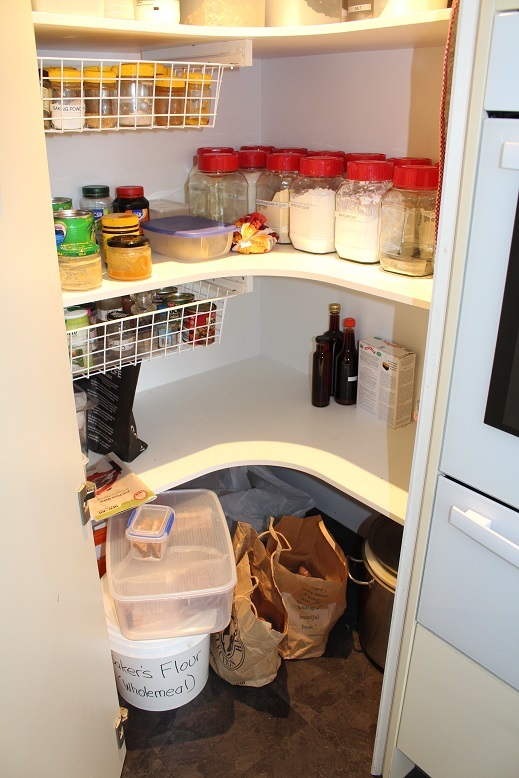 I have moved a few things out of the pantry – a large coffee plunger which now lives on the shelf above the oven with the other coffee plunger and the teapot. The coffee grinder which we never use is going to the op shop along with a plastic container which belongs in the freezer but I never have it in there as it just wastes space and limits how much I can pack in. Finally, the pile of plastic plates and bowls (meant to be disposable but I keep washing and re-using them) have been moved from the pantry. I have kept 2 of each in the cupboard for the grandchildren but the rest will be stored in the sideboard for use at BBQ’s or other events. One day I may decide to offload them altogether but not just yet. I did not take a photo of the bottom shelf and the floor but suffice to say they look a bit better, too.